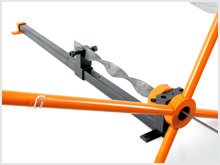 The biggest of our metal twisters is our MC009 XL Twister which makes light work of twisting metal bars up to 40mm x 8mm or 16mm square and is essential for those wanting to make lots of twisted wrought iron bars. Using the same basic principle as it’s smaller Practical and Master Twisting tool counterparts, to create a decorative steel bar you grip the section of bar you wish to twist in the round collar at one end and the slide arrangement that can move freely up and the steel twister body. This helps ensure even spaced and consistent twists every time. 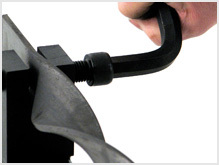 Bars are gripped at each end using the grub screws in the collar and the bolts in the slide. Simply rotate the four handles to until the required number of twists are achieved. 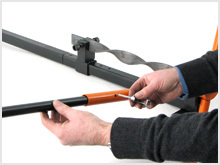 For larger steel bars extendable handles deliver extra twisting power.